1 A None No Power Seat 1 A is a standard Business Class seat whose proximity to the lavatory and galleys may be bothersome. 1 C None No Power Seat 1 C is blocked for use by the Business Class passenger in adjacent seat. 1 D None No Power Seat 1 D is a standard Business Class seat whose proximity to the lavatory and galleys may be bothersome. 1 E None No Power Seat 1 E is blocked for use by the Business Class passenger in adjacent seat. 1 F None No Power Seat 1 F is a standard Business Class seat whose proximity to the lavatory and galleys may be bothersome. 10 A None No Power Seat 10 A is an Economy Class Exit Row seat with extra legroom. The tray table is in the armrest, making the armrest immovable and slightly reducing seat width. There is no floor storage during take-off or landing. 10 C None No Power Seat 10 C is an Economy Class Exit Row seat with extra legroom. The tray table is in the armrest, making the armrest immovable and slightly reducing seat width. There is no floor storage during take-off or landing. 10 D None No Power Seat 10 D is an Economy Class Exit Row seat with extra legroom. The tray table is in the armrest, making the armrest immovable and slightly reducing seat width. There is no floor storage during take-off or landing. 10 E None No Power Seat 10 E is an Economy Class Exit Row seat with extra legroom. The tray table is in the armrest, making the armrest immovable and slightly reducing seat width. There is no floor storage during take-off or landing. 10 F None No Power Seat 10 F is an Economy Class Exit Row seat with extra legroom. The tray table is in the armrest, making the armrest immovable and slightly reducing seat width. There is no floor storage during take-off or landing. 2 C None No Power Seat 2 C is blocked for use by the Business Class passenger in adjacent seat. 2 E None No Power Seat 2 E is blocked for use by the Business Class passenger in adjacent seat. 25 C None No Power Seat 25 C is a standard Economy Class seat whose proximity to the lavatory and galley may be bothersome. 25 D None No Power Seat 25 D is a standard Economy Class seat whose proximity to the lavatory and galley may be bothersome. 26 A None No Power Seat 26 A is a standard Economy Class seat in the last row of the aircraft whose proximity to the lavatory and galley may be bothersome. 26 C None No Power Seat 26 C is a standard Economy Class seat in the last row of the aircraft whose proximity to the lavatory and galley may be bothersome. 26 D None No Power Seat 26 D is a standard Economy Class seat in the last row of the aircraft whose proximity to the lavatory and galley may be bothersome. 26 E None No Power Seat 26 E is a standard Economy Class seat in the last row of the aircraft whose proximity to the lavatory and galley may be bothersome. 26 F None No Power Seat 26 F is a standard Economy Class seat in the last row of the aircraft whose proximity to the lavatory and galley may be bothersome. 3 C None No Power Seat 3 C is blocked for use by the Business Class passenger in adjacent seat. 3 E None No Power Seat 3 E is blocked for use by the Business Class passenger in adjacent seat. 4 C None No Power Seat 4 C is blocked for use by the Business Class passenger in adjacent seat. 4 E None No Power Seat 4 E is blocked for use by the Business Class passenger in adjacent seat. 5 A None No Power Seat 5 A is a standard Economy Class seat that may have some extra legroom as there is no bulkhead wall, only a plastic card divider. 5 C None No Power Seat 5 C is a standard Economy Class seat that may have some extra legroom as there is no bulkhead wall, only a plastic card divider. 5 D None No Power Seat 5 D is a standard Economy Class seat that may have some extra legroom as there is no bulkhead wall, only a plastic card divider. 5 E None No Power Seat 5 E is a standard Economy Class seat that may have some extra legroom as there is no bulkhead wall, only a plastic card divider. 5 F None No Power Seat 5 F is a standard Economy Class seat that may have some extra legroom as there is no bulkhead wall, only a plastic card divider. 9 A None No Power Seat 9 A is a standard Economy Class seat with a misaligned window that may have limited recline due to the exit row behind. 9 C None No Power Seat 9 C is a standard Economy Class seat that may have limited recline due to the exit row behind. 9 D None No Power Seat 9 D is a standard Economy Class seat that may have limited recline due to the exit row behind. 9 E None No Power Seat 9 E is a standard Economy Class seat that may have limited recline due to the exit row behind. 9 F None No Power Seat 9 F is a standard Economy Class seat with a misaligned window that may have limited recline due to the exit row behind. SWISS offers complimentary beverage and meal service on all of its flights. Meal service, depending on time of day and length of flight, might range from a small snack to a multi course gourmet meal. Special meals are available and must be ordered in advance of your flight. The Swiss Bombardier CS100 aircraft is operated on short-haul routes. This CS100 features a 2 class configuration with 20 Business Class seats and 105 Economy Class seats. This plane has a movable divider between the Business and Economy sections, so other configurations are possible. 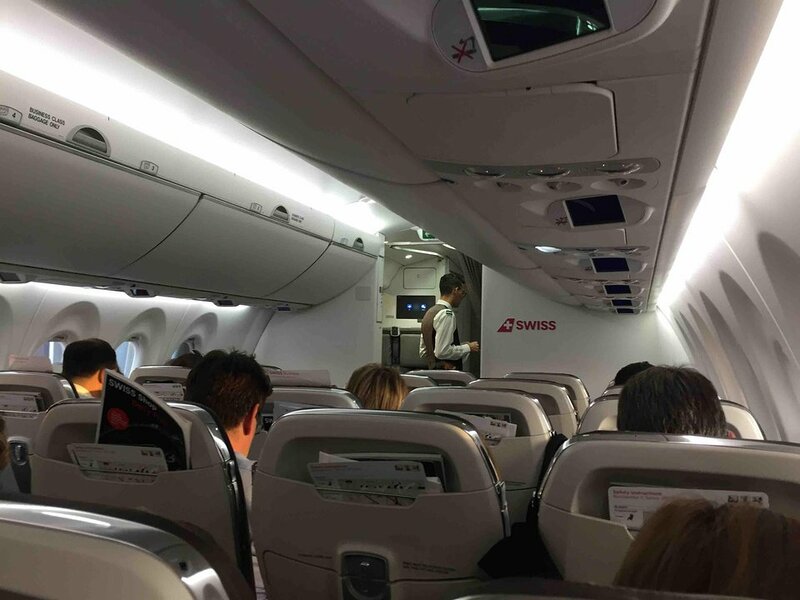 For short flight ZRH-KRK, 1h40m seat 33A was OK but passengers were seated together rather than spread out on the near empty flight. Also, SWISS failed to transfer my check-in bag from previous flight.Bag was delivered 34 hours later! !Very disappointed with SWISS.Will not fly with SWISS again. 3F has the best seat to window alignment of the business cabin. It's a great seat. Lots of leg room, but the tray table is in the seat in front of you - not in the arm rest. The left arm rest has less depth than the right arm rest because of the exit door. I liked the seat because it had mesh pockets for a small water bottle or even a cell phone. I changed at the last minute to this seat so that I could have the window and aisle to myself. I found the seat to be comfortable, and the service was very good and quick. Only took one hour five mins. for the flight from Nice to Zurich. Excellent view as we flew over Lake Léman I would have no reservation about flying this plane in the future. Incorrect comment. There is no curtain divider on this aircraft, only a card inserted in the seat headrest. Like other Suisse aircraft the division between business and economy is flexible. The emperor is wearing no clothes! The dimensions show you that the economy seats and the "business" seats are identical. The only difference is that they don't let someone sit next to you in business class. What a waste of money! What a fraud! The seats are all small and uncomfortable. How about a little truth in advertising? Row 26: like other seats on the SWISS CS100 also the seats in last row can be reclined normally. The "bad seat" classifying is IMO wrong. Generally nice legroom with an innovative seat (and table) design. On a shorthaul aircraft I have never (!) seen such a generous legroom like in row 10. In Business Class seats B and E are blocked for comfort. A Movable Class Devider has not yet been installed due to difficulties with the "Pivot overhead bins" that open downwards. The bins are huge. Nice, modern and fresh cabin design, large lavatories. Row 5 is a standard economy row and shouldn't be "Green". The seat has a standard pitch compared to the other fist rows of the plane who can be converted into Business Class. Legroom is still very good in all rows, but specially in row 10 with the emergency exit. 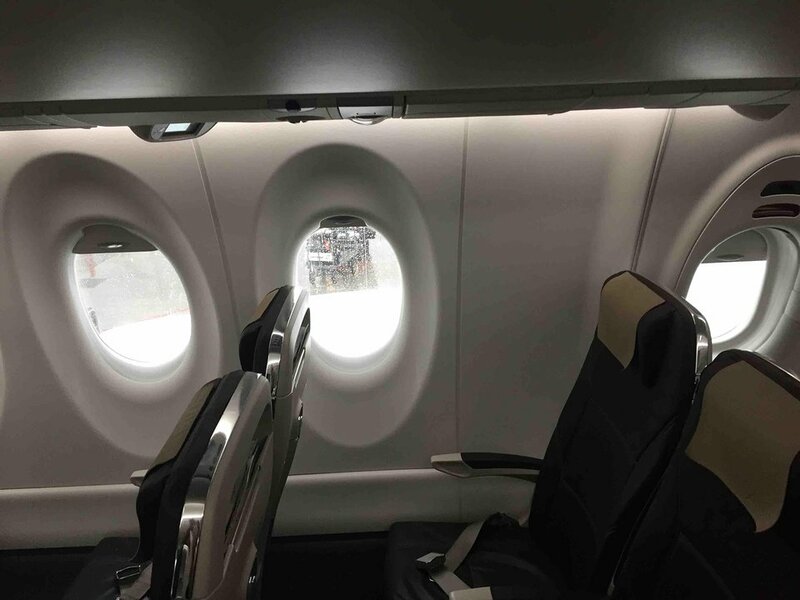 The emergency row has a huge amount of legroom but the window is much smaller than in other rows and the windows in row 10 are slightly misaligned do to them being in the door of the emergency exit. No under-seat storage for take-off and landing. Row 10 is the one you want if you're tall. Seat 10A had more legroom than most of the domestic First Class flights I've been on, let alone economy. Being 6'1", my knees touch the seat in front on most economy seats, even with 32" pitch. My knees had at least 6" of clearance from the seat in front of me in 10A on this aircraft, maybe even 8". The exit door itself didn't protrude into the space for 10A at all, however, the armrest attached to the cabin wall was uncomfortably short. A small price to pay for excellent legroom in my opinion, though. Excellent seat, this seat has the best legroom for economy seat I have experienced in my whole life. Highly recomended. I have first have checked for 6C but were reassigned to 5C and this seat was great. Not a red (bad) seat IMO. Comfort is just the same as in all other seats on this plane. All the seats in the back row (26) have recline and I would think it is just the aisle seats that gets bumped by people passing to and from the rear lavatory. The lavatory itself is very spacious and pleasant, especially compared to the new horrible slimline lavs in the 737s, this one is a winner! Reasonable legloom (I'm 195) thanks to the slimline seats which are quickly becoming the normal standard these days. Good size overhead bins. Fresh, clean and modern, some nice details in the interior. 2+3 seating with one fancy detail; the middle seat is a few centimeters wider than the others to make it more acceptable to the pasengers! Bombardier and Swiss boasts about the quietness, but oh-oh, not so I'm afraid. The engines themselves are quite quiet, but a deep rumble behind the engines plus the aircondition noise adds up to at least the same interior noise level as a B737 or Embraer jet. Another issue to be aware of: Winter 2016/17 the CS100 is only certified for CAT I landings, i.e. there will be a few weaher related diversions around Europe until the full auto-land capability (CAT III) has been certified. (2017/2018) So, if you plan a trip into a foggy location you might consider another ride this winter. SWISS flies 1 versions of Bombardier CS100.